Okinawa is not, nor ever has been, the name of a nation (the Ryūkyū Kingdom had been, until 1875), but rather is the name of the largest island of the Ryūkyū islands, a chain of islands in the western Pacific Ocean at the eastern limit of the East China Sea, stretching southwest from Kyūshū to Taiwan. 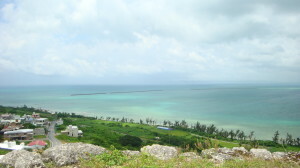 As such, Okinawa is in close proximity to mainland Japan, the Korean peninsula, and the southeastern coast of China. Due to its central location, Okinawa was greatly influenced by these other cultures, with a long history of trade and cultural exchange with China that greatly influenced the development of martial arts on Okinawa. The precursor of present-day Okinawan martial arts is believed to have come by way of visitors from China. In the 7th century, Chinese martial arts were introduced to Okinawa through Taoist and Buddhist monks. These styles were practiced in Okinawa and developed into Te over several centuries. In the 14th century, when the three kingdoms on Okinawa (Chūzan, Hokuzan, and Nanzan) entered into a tributary relationship with the Ming Dynasty of China, Chinese Imperial envoys and many other Chinese arrived, some of whom taught Chinese Chuan Fa (Kempo) to the Okinawans. The Okinawans combined Chinese Chuan Fa with the existing martial art of Te to form Tō-de, sometimes called Okinawa-te. In 1429, the three kingdoms on Okinawa unified to form the Kingdom of Ryūkyū. When King Shō Shin came into power in 1477, he banned the practice of martial arts. Tō-te and kobudō continued to be taught in secret. The ban was continued in 1609 after Okinawa was invaded by the Satsuma Domain of Japan. The bans contributed to the development of kobudō, which uses common household and farming implements as weaponry. By the 18th century, different types of Te had developed in three different villages - Naha, Shuri, and Tomari. The styles were named Naha-te, Shuri-te, and Tomari-te, respectively. Practitioners from these three villages went on to develop modern karate. The island is largely composed of coral rock, and rainwater filtering through that coral has given the island many caves, which played an important role in the Battle of Okinawa. Gyokusendo, an extensive limestone cave in the southern part of Okinawa's main island, is a popular tourist attraction. Okinawa is said to have the most beautiful beaches in all of Japan and normally enjoys temperatures above 68°F (20°C) for most of the year. Okinawa and the many islands that make up the prefecture boast some of the most abundant coral reefs found in the world. Rare blue corals are found off of Ishigaki and Miyako islands as are numerous species throughout the chain. Many coral reefs are found in this region of Japan and wildlife is abundant. Sea turtles return yearly to the southern islands of Okinawa to lay their eggs. The summer months carry warnings to swimmers regarding poisonous jellyfish and other dangerous sea creatures. Okinawa is a major producer of sugar cane, pineapple, papaya, and other tropical fruit, and the Southeast Botanical Gardens represent tropical plant species.